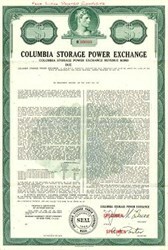 Beautiful engraved specimen certificate from the Columbia Storage Power Exchange printed in 1972. This historic document was printed by American Bank Note Company and has an ornate border around it with a vignette of a man's head. This item has the printed signatures of the Company's President and Secretary. Columbia Storage Power Exchange (CSPE). The CSPE is a nonprofit corporation formed by eight public and three private utilities in 1964 to implement portions of the Columbia River Treaty with Canada. Under the treaty, Canada agreed to build two storage dams and one dam for generation on the upper Columbia, resulting in greater power and flood control benefits at U.S. facilities downstream. Canada receives half of the increased output at U.S. dams - a share referred to as the Canadian Entitlement. Not needing the additional power, Canada sought to sell its entitlement under 30-year contracts to the United States. The CSPE was formed to purchase and market the Canadian Entitlement until needed by Canada. The power purchased by the CSPE is marketed to 41 public and private utilities; some of these have in turn sold their share to other public and private utilities in the Northwest and California. Specimens were also used to show prospective clients different types of certificate designs that were available. 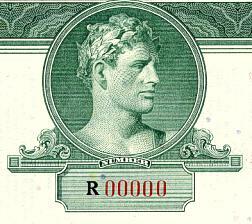 Specimen certificates are usually much scarcer than issued certificates. In fact, many times they are the only way to get a certificate for a particular company because the issued certificates were redeemed and destroyed. In a few instances, Specimen certificates we made for a company but were never used because a different design was chosen by the company. These certificates are normally stamped "Specimen" or they have small holes spelling the word specimen. Most of the time they don't have a serial number, or they have a serial number of 00000. This is an exciting sector of the hobby that grown in popularity over the past several years.